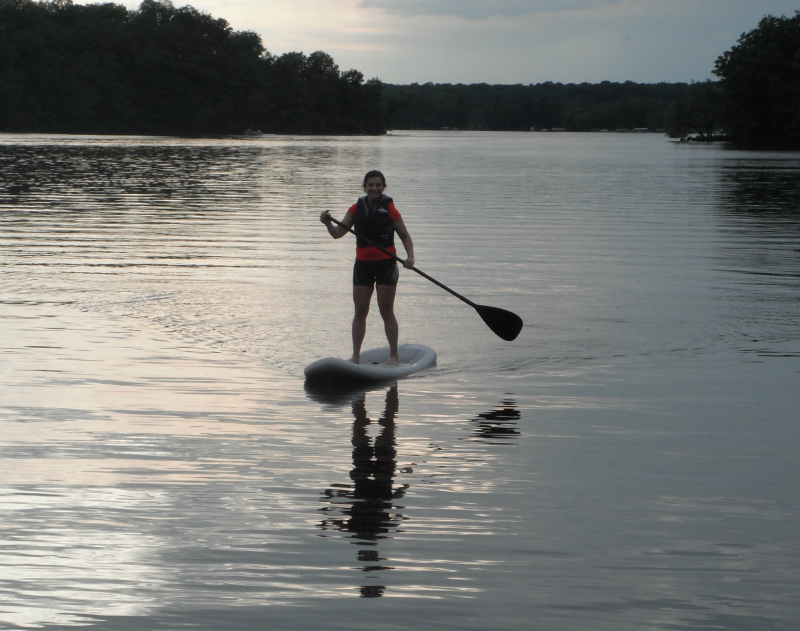 Stand-up paddleboarding. It looks easy, and when you ask someone about the degree of difficulty, they assure you that it's not tough to get started. But they fail to mention that it's about 10 times harder to stand up when the water is wavy, the current pushes you back toward the shoreline, and the inflatable board you're on is going to give more than the more rigid variety. That was day one. Above is day two. Far easier to stand up when the water is calm and the current is not as forceful. SUP is fun--not that I doubted it. It's hard on the tiny muscles that often get ignored in other activities. I can feel it firing up my core and even my quads (a result of the death grip my toes have on the board). I could do it for hours--and I say that after walking off the back of the board and into the cold lake.